Jung once wrote "Show me a sane man, and I'll cure him for you." Why would anyone want to "cure" someone who is "sane"? Read my essay to find out. Also, on 9/15/17, therapists can, for the first time, get CEU's for attending my program on dreams; details are below. There's also a fine poem by Mark Nepo on moving from efforts to be "good" to efforts to be "real." And a music video by Bruce Springsteen that illustrates the value of taking risks, even when it means making mistakes...in front of tens of thousands of people! I hope you find something here that speaks to your experience, and that offers you inspiration, support, and hope. Reflections: “The Cure For Sanity"
​“Show me a sane man, and I’ll cure him for you.” This quote from Jung is on a framed bookmark that hangs just to the right of the door to my office where everyone can see it as they leave. The “sane” person that Jung speaks of is the one who distorts his or her true self in order to fit in and gain a false sense of belonging, someone who adapts in order to become “normal” and be accepted by and blend in with the culture around them. The “cure” is what Jung calls “individuation”—the process of reconnecting with who we truly are, and then bringing that unique individual to the culture in ways that enrich it, make it more diverse, more interesting. As a Jungian psychotherapist, my job is to create a safe time and space where each individual can look deeply at their life, transform their suffering into meaning, and reconnect with their own true, deep, inner voice…and their own true, deep, inner agenda for living. I offer support, and help each person grow stronger and more confident in their sense of self, so they can then take that precious, irreplaceable Self out into the wider world. There, the unique light that is each one of us can shine brightly and beautifully, like stars in the sky. (poem): "Crossing Some Ocean In Myself" (Mark Nepo). An exquisite articulation of the progression from "gargantuan efforts to be good," to "burning old masks," to "my efforts to be real." From Nepo's wonderful new book of collected poems The Way Under The Way. 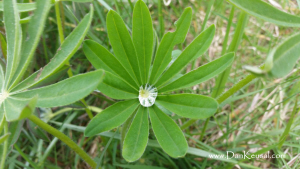 (photo): "Water droplet on Lupine leaves" (by Dan Keusal). Click on the photo to read more about it, and to download a copy for your personal use and enjoyment.